Hide deals from seller "Golfsmith Golf & Tennis"
Hide deals from category "Sporting Goods"
$15 for $25 Golfsmith Gift Card. Mailed to Chicagoland Addresses Only. Subscribers who purchased previous WhereYouShop/Deals Magazine Golfsmith deal are ineligible. Gift card cannot be redeemed for cash, except where required by state law. Golfsmith is not responsible for lost or stolen cards. NO FEES ARE CHARGED ON GOLFSMITH’S GIFT CARDS AND THEY HAVE NO EXPIRATION DATE. Enjoy a swinging good deal for 40% off a gift card to Golfsmith Golf & Tennis, the largest nationwide retailer of golf and tennis gear. With purchase, you will also receive a FREE subscription to the print edition of Deals Magazine, mailed to you. Deals Magazine will never cost you a penny, but will save you millions of them! Golfsmith offers the best selection of the biggest brands in the game. From Callaway, TaylorMade, Nike, PING, Titleist, Ashworth, Head/Penn, Babolat, Prince, Wilson and many more - all at the guaranteed lowest price. Shop in more than 70 stores nationwide, visit online at Golfsmith.com, or call our sales associates at 1-800-396-0099. The largest nationwide retailer of golf and tennis gear. Allow 7 business days for delivery. Golfsmith gift card will be mailed to shipping address indicated at checkout. 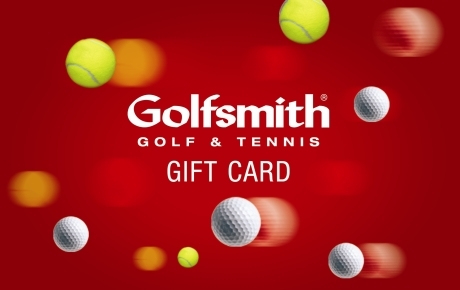 Once received, Golfsmith gift card can be used at the Golfsmith location nearest to you.